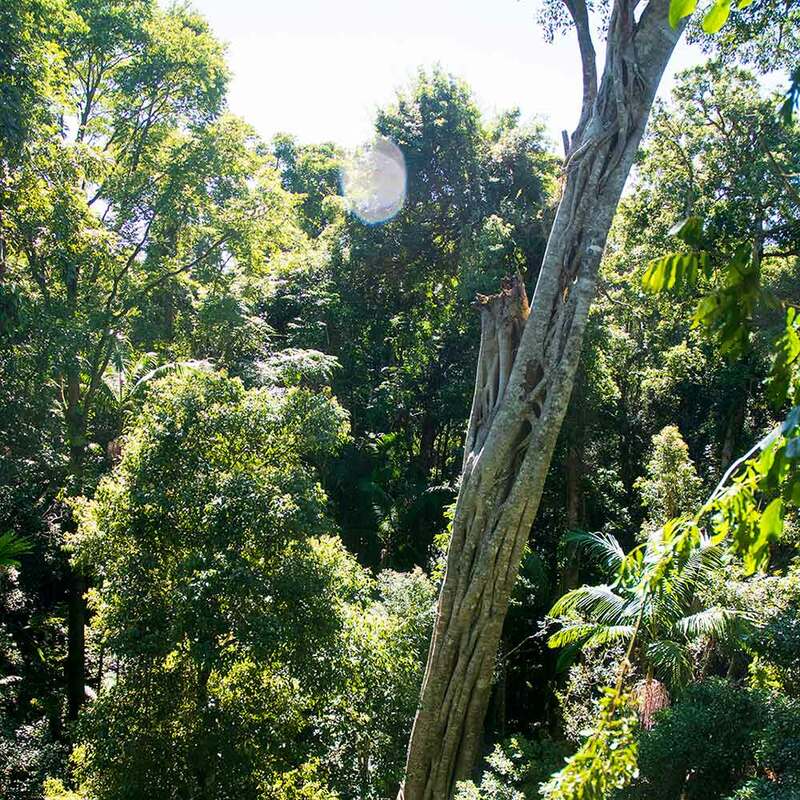 The Mary Cairncross Scenic Reserve, Maleny, with the Sunshine Coast Council, hosted a BioBlitz at the end of March 2019. 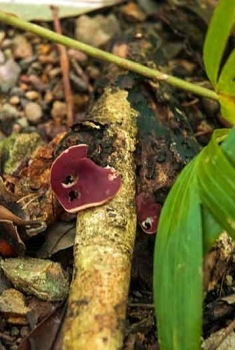 They invited scientists, artists and members of the community to intimately observe and celebrate the Reserve’s unique rainforest biodiversity. 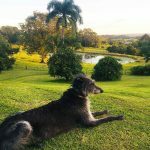 I have lived in Maleny for 10 years now and am very fond of this Reserve. 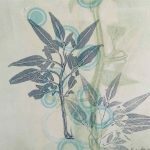 I have walked around and through the park on coutless occassions, and showed work with the Maleny Printmaker’s exhibition, After Dark, late 2018. 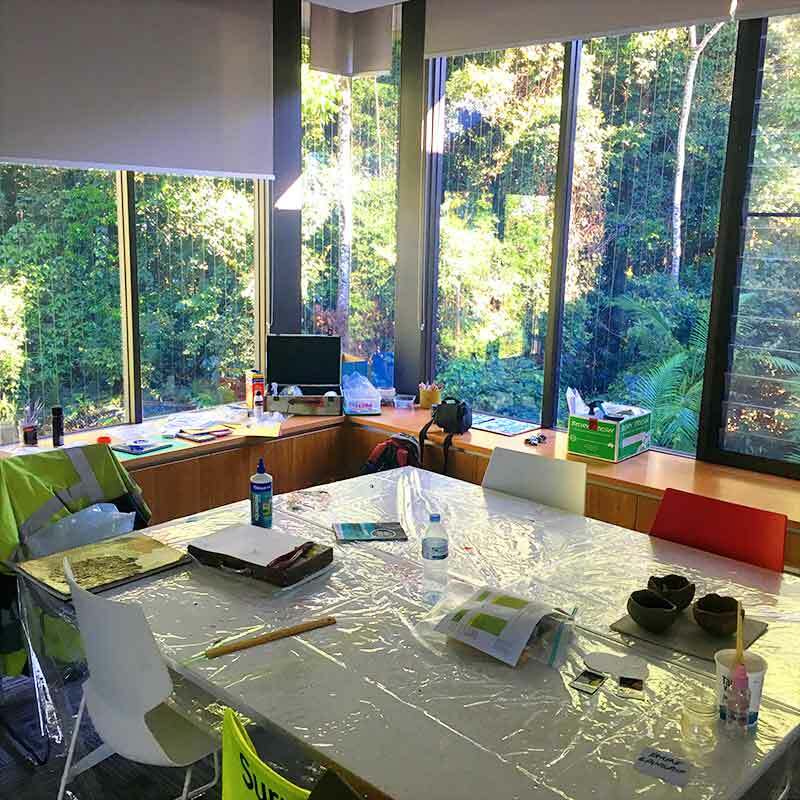 The opportunity to join the residency team and contribute to this project was exciting; such a privilege to be given access to the property and work alongside a team of people passionate about the environment. I was one of 6 artists who formed the ‘creative’ component of the Survey Team. A team of scientists were bought together for the other half of the Survey Team. 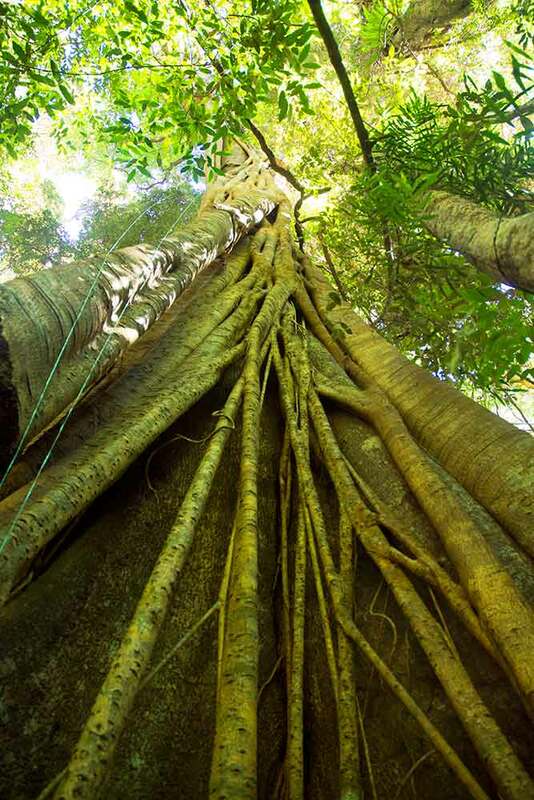 Together we were tasked with identifying, observing and documenting what was living in, on and within 5 strangler figs at Mary Cairncross Scenic Reserve in Maleny. 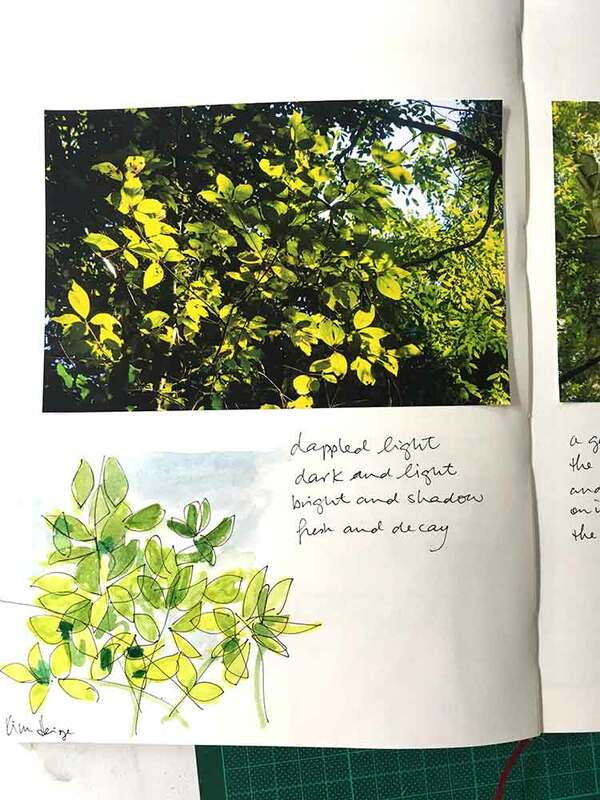 For the artist’s involvement, each tree was allocated its own visual diary; and we were to fill the pages with our observations – drawings, pictures, words, marks. Whatever we wanted to include. 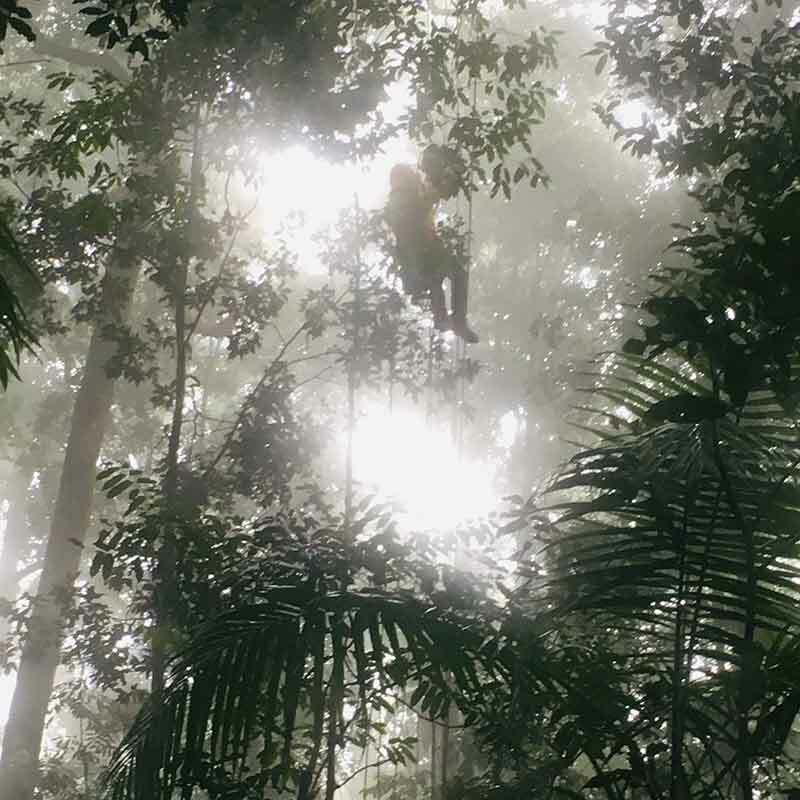 Scientists were sent high into the canopy to observe, document and study critters and plants and specimens and ecosystems. 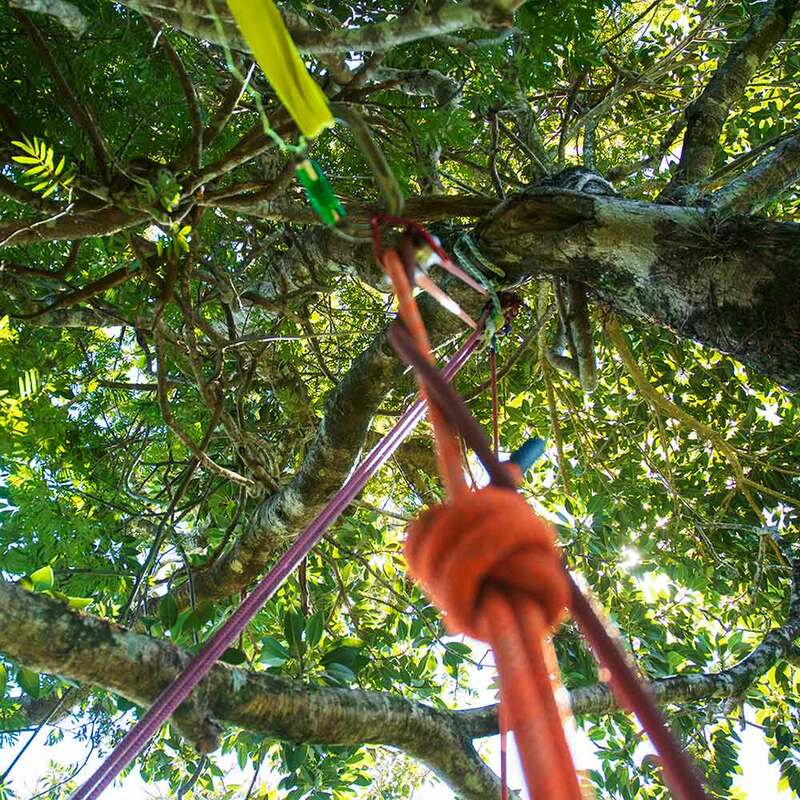 Plus it was planned that each artist would be given the opportunity to venture high into the canopy of at least one of the Survey Trees. 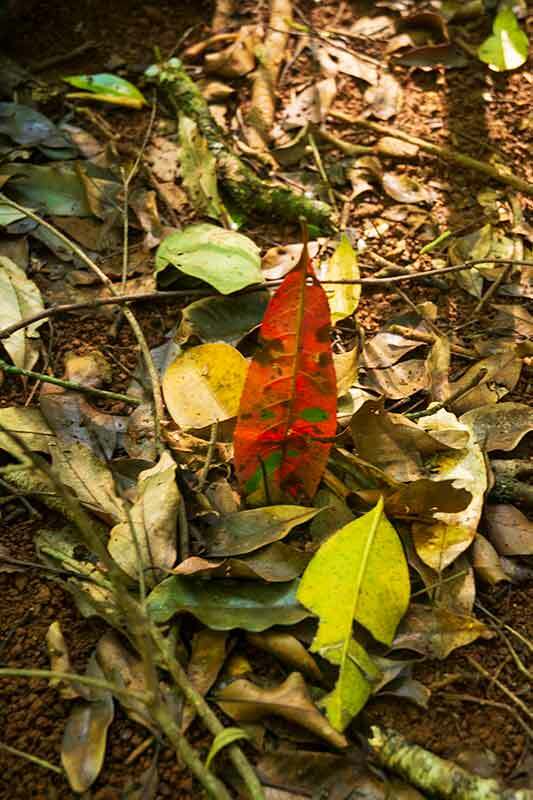 I was scheduled to ascend into the rainforest canopy on Day 1 of the BioBlitz. But it was raining. And raining. And raining. 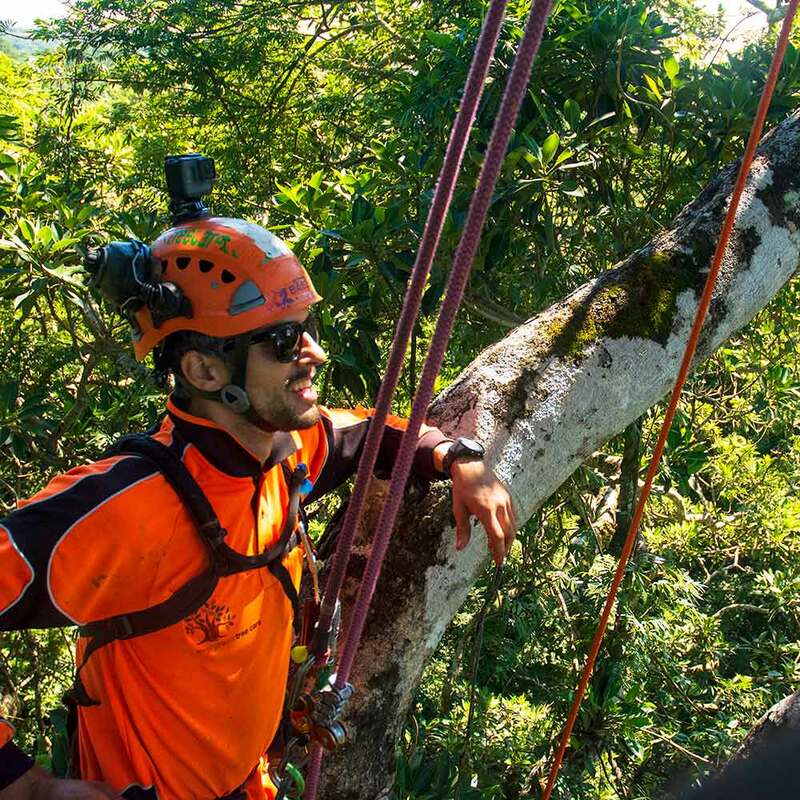 Evergreen Treecare were the tree angels assigned the task of safely raising and lowering artists and scientists into the trees. And while they held our safety top-of-mind, they also worked hard to protect the trees we were working in. They took safety very seriously, but the rain threw all plans into a spin. Alas, due to weather, my tree climb was delayed a few days. 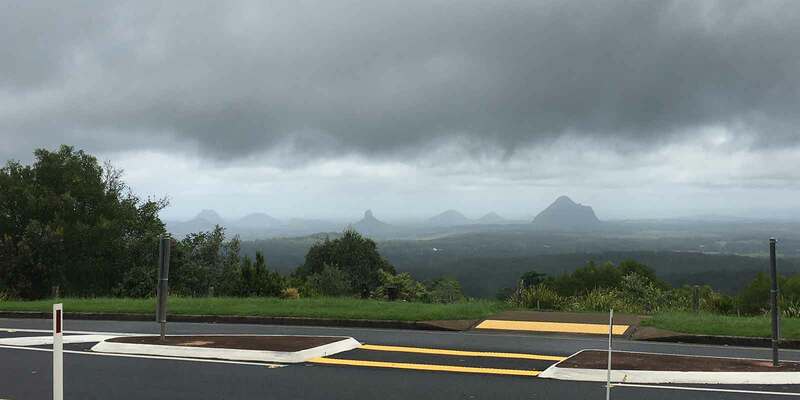 Does the 2nd photo above (of the Glass House Mountains) look familiar? This is the vantage point that was inspiration for my ‘You are here’ reduction linocut print. My turn came about on the final day of the BioBlitz. Day 4, ascending into the canopy of Mook Mook, aka Tree #3. The picture below I hope give you some idea of what it looked like. I was suspended, hanging, inside the canopy. 43 metres above terra firma. 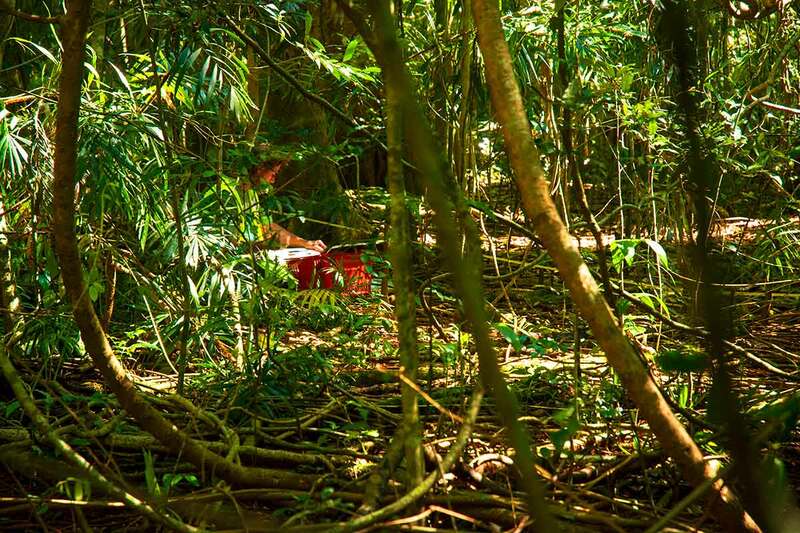 I could see distant ranges through the canopy foliage. I could have seen the ocean if I kicked myself away from the safety of the nice big fat tree trunk, but my rational brain wouldn’t allow me to relax long enough to do that! I did let go of the ropes for about 2 seconds. Look mum, no hands! Then the knowing that I was suspended 43 metres up a tree reminded me to hold on. Tight. I didn’t feel at all like I was going to fall; rather it was the ‘knowing’ of where I was that made it difficult to relax. But it was a beautiful experience. It was a privilege. And one I would love to do again. I like this explanation by the UK’s Amatuer Entomologists Society … A BioBlitz is an intense period of biological recording within a specific area. 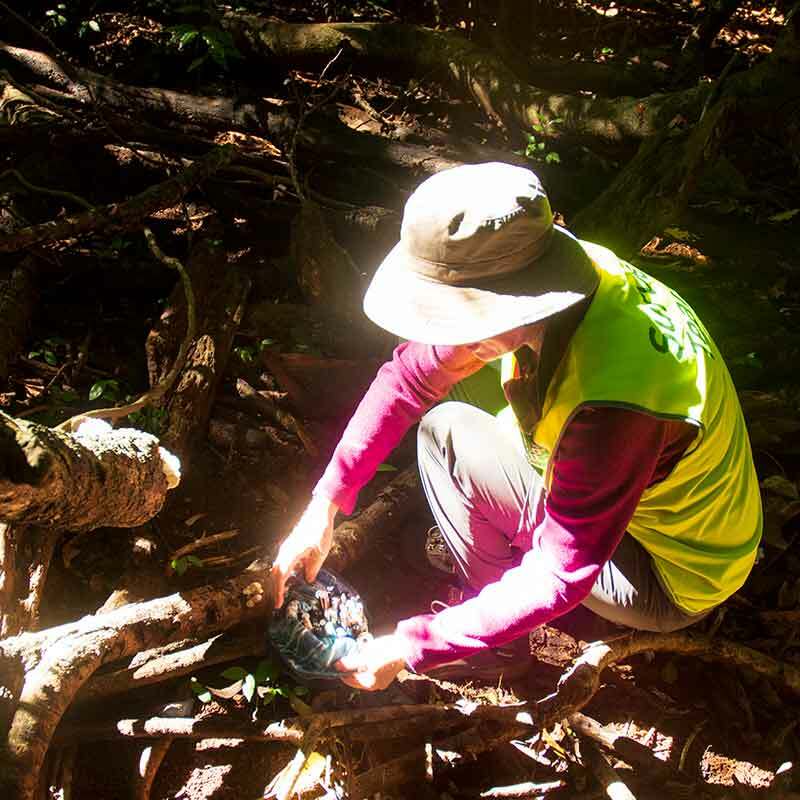 A BioBlitz usually takes place over a 24 hour period and involves experts and amateurs taking an inventory of all the living organisms within an area. These areas are commonly parks or other urban spaces. And this is how the Sunshine Coast Council describe it … A BioBlitz is an event that focuses on finding and identifying as many species as possible in a specific area over a short period of time. 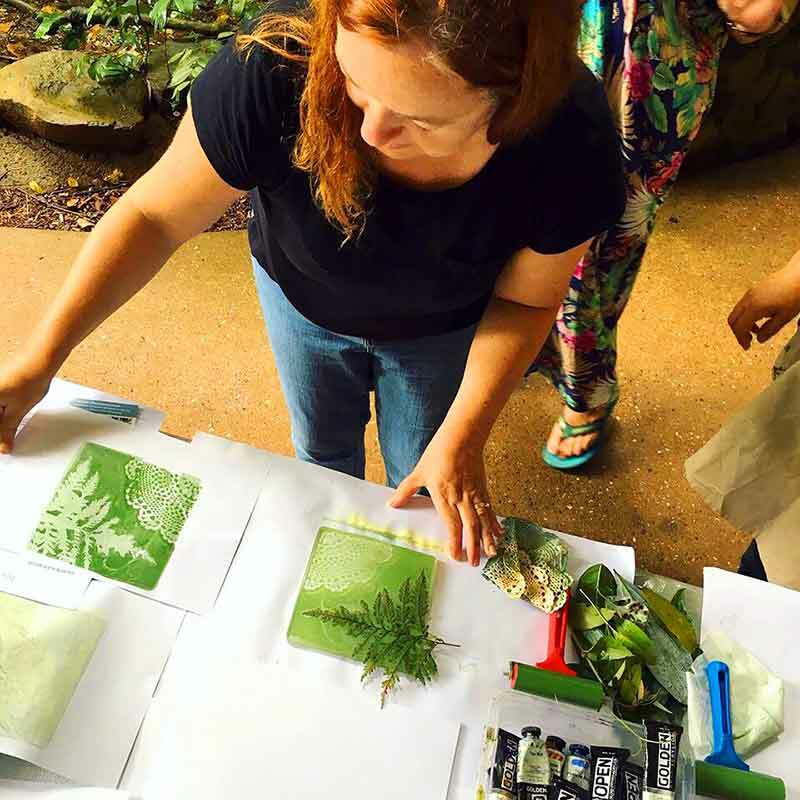 At a BioBlitz, scientists, families, students, teachers, and other community members work together to get a snapshot of an area’s biodiversity. These events can happen in most any geography—urban, rural, or suburban—in areas as small as a backyard or as large as a country. ABC Sunshine Coast wrote a great summary of the BioBlitz, talking about the scientific findings of the event. 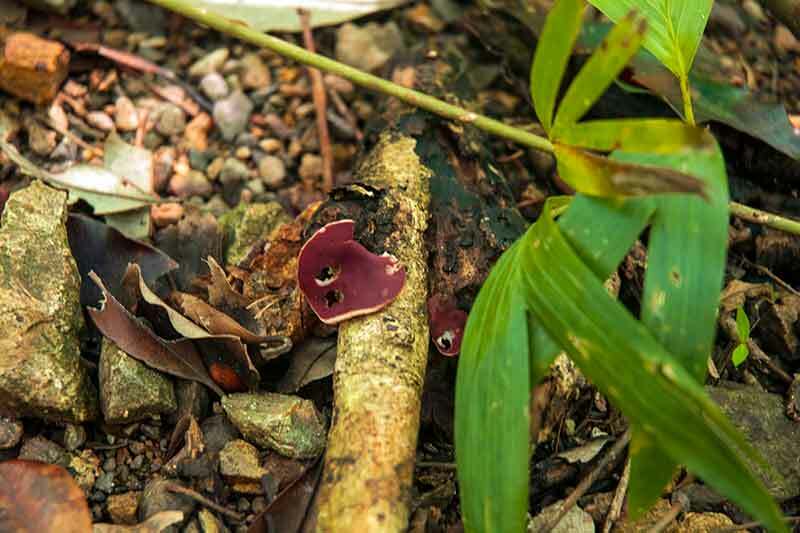 Findings such as identifying a tiny 6cm-long, nectar and pollen-eating eastern blossom bat not previously recorded at the park, and 100 specimens of fungi sent to the Queensland Herbarium for identification. Five (5) Strangler Figs (Ficus watkinsiana) were selected for the BioBlitz survey, over a four (4) day and night study period. 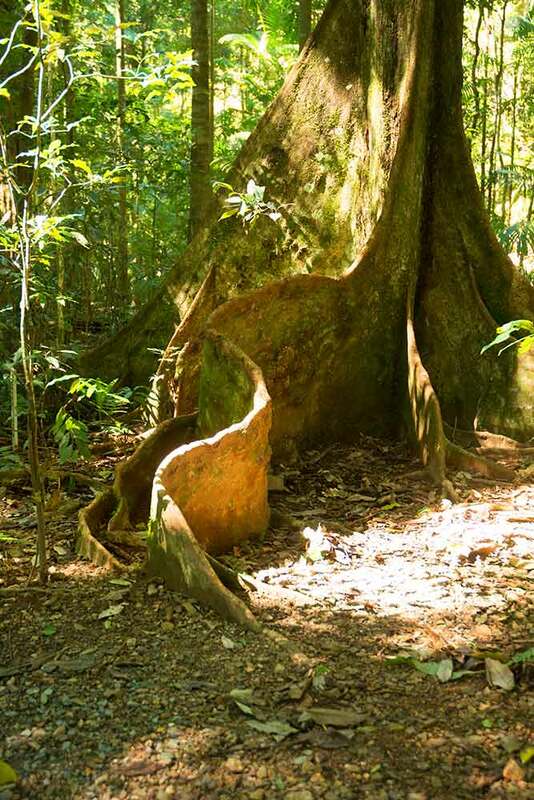 The Mary Cairncross Scenic Reserve sits within Jinibara country, so each of the trees were given a Jinibara name, selected by Uncle Noel. I know the region has a rich indigenous history, but my knowledge of that history is limited. I learned more during the BioBlitz, and there is so much more I want to learn. Rich and colourful. 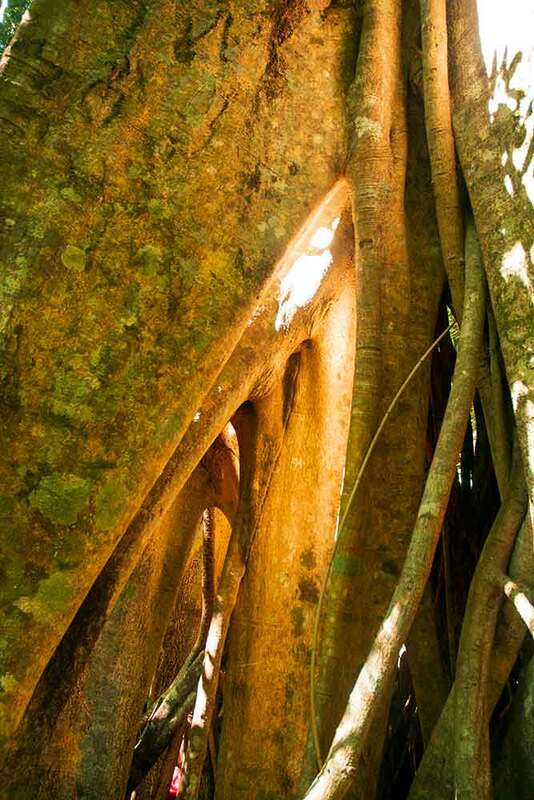 Strangler Figs have held a fascination for me since I was a child. 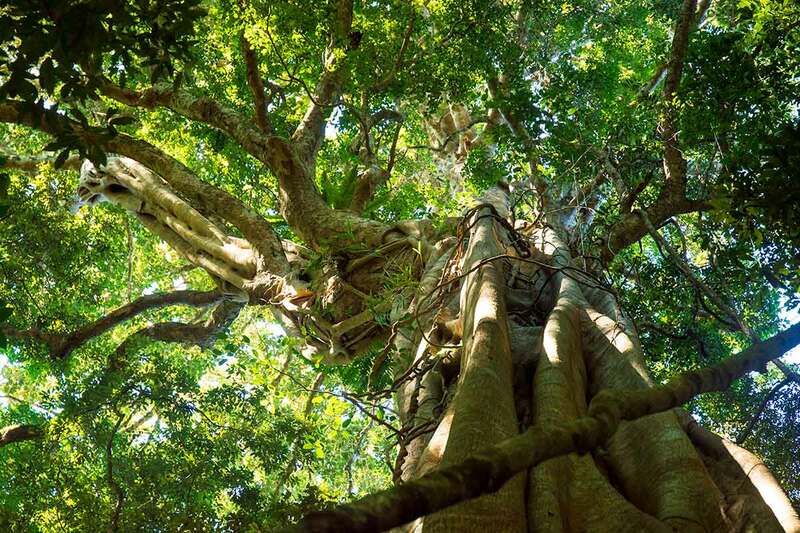 I can remember childhood rainforest walks, feeling in awe of the vine structures covering tree trunks, reaching for the sky; buttress roots fanning out of the soil like curtains. The desire to touch and caress the trees, to feel the texture of its bark and strength of its structure, almost to feel it breathing, was always very strong. 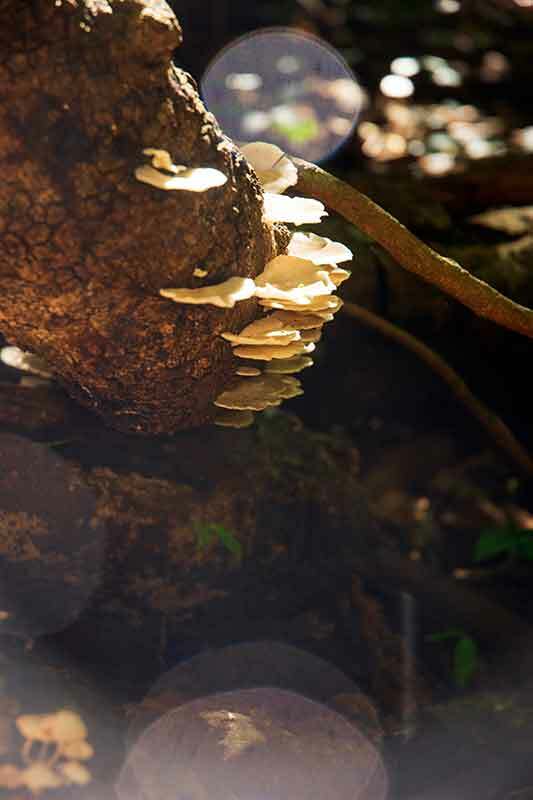 In some parks and forests it is possible to touch the trees; the caress their structures and explore their base. But at Mary Cairncross, conservation is a strong focus and the trees are protected from such activity with allocated walkways. 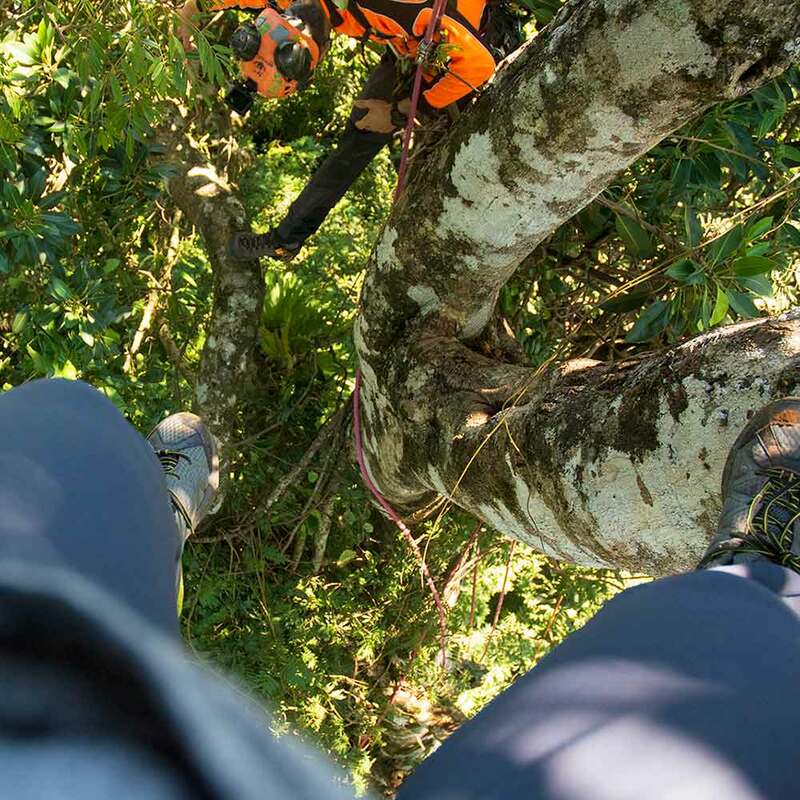 This BioBlitz experience allowed the Survey Team to step off the allocated walkways and connect intimately with the trees. In a lot of ways I felt like a kid again, exploring a secret world. With rain and precious time availability, I wasn’t able to spend any quality time with Gureya. She was the closet tree to Base Camp, and, like them all, a beautiful specimen. 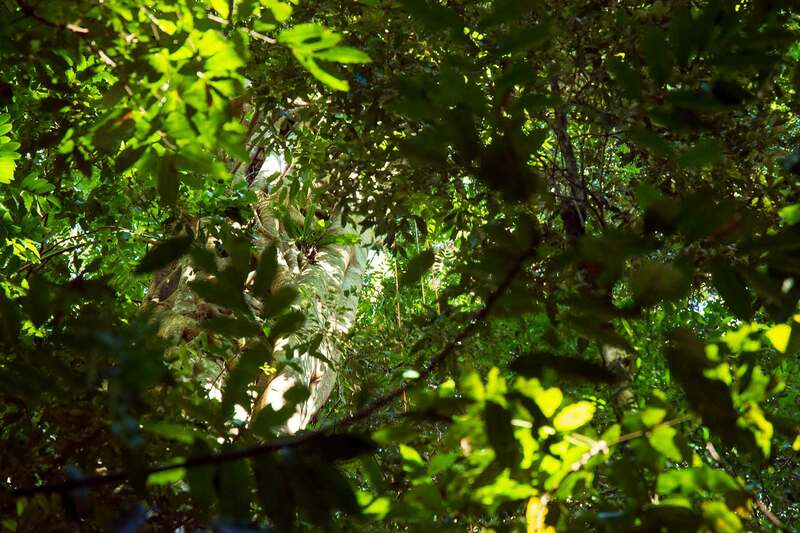 I did manage a photo of her … you can see her reaching for the sky through the layers of tree tops. 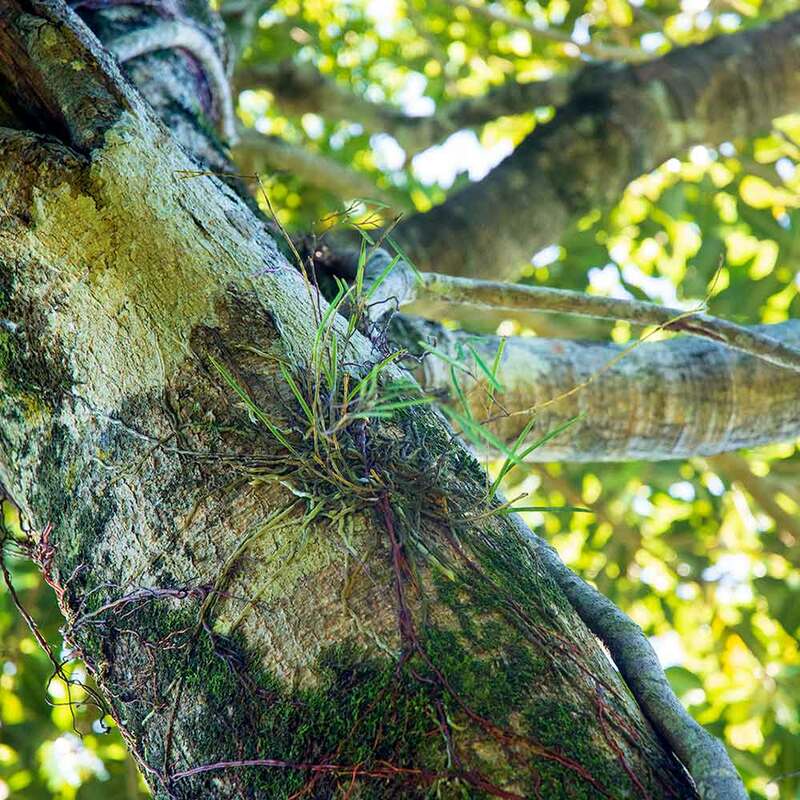 She had many birds nest ferns resting comfortably in the crooks of her branches and vines. BarrBarr was the other survey tree I wasn’t able to spend time with. And no photos for this tree either. She was probably the most remote tree sitting across from the main path on the other side of Fryers Creek. The rain meant that very few of the Survey Team got to her, and I got the sense that she liked it that way. She seemed comfortable to be sitting just out of reach. Mook Mook gave me a few very special hours on the last morning of the BioBlitz. This was the tree that I was afforded the privilege of ascending into her canopy. While waiting my turn to ascend, I explored her canopy perimeter on the forest floor. I discovered my first giant earthworm home; and once I knew what I was looking at, suddenly they were everywhere. 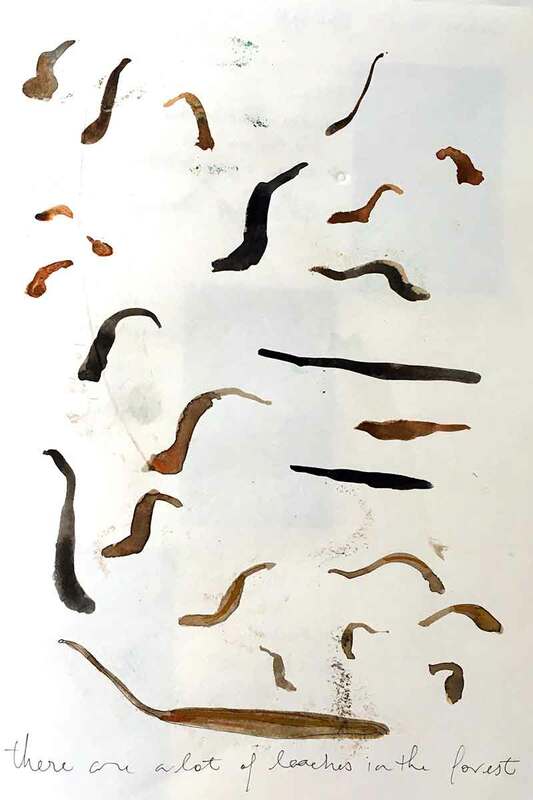 It struck my just how bare the forest floor was – nearly all of the fallen leaf matter had been dragged to the entrances of the giant earthworm homes. I didn’t see any giant earthworms though. I wonder what they look like? Do they have teeth? What colour are they? Are they friendly? Do they have eyes? This precious waiting time gave me the opportunity to really Stop. Look. Listen. Observe. 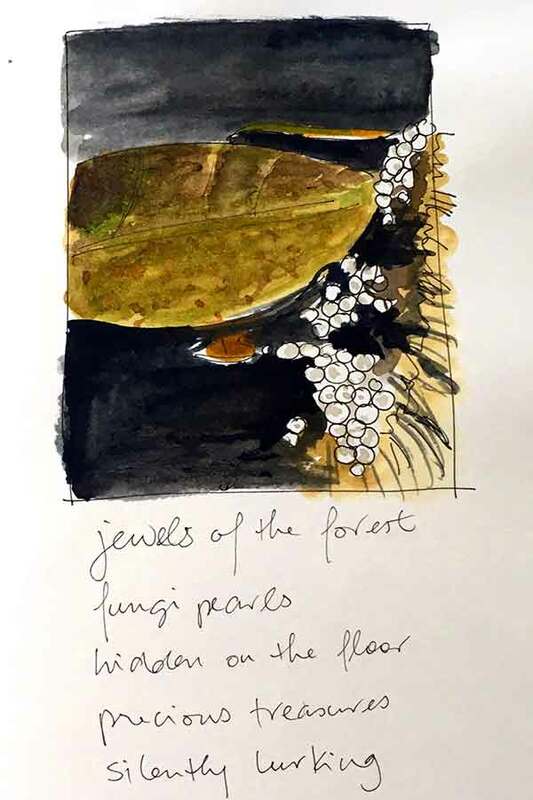 It was a privilege to be allowed to step off the main walking track and quietly observe and explore. I could satisfy my urge to touch and feel the textures of branches, trees, roots and leaves. Carefully stepping in and around roots and branches so as to not damage anything in my path. I took photos for reference for future artworks. And made sure not to pick up any Gympie Gympie Vine, or get snagged on Lawyer Vine. Then my turn came and I was allowed to climb. 43 metres up into the canopy. Excited. Nervous. Exhilarating. Below are some photos taken while exploring her canopy floor. 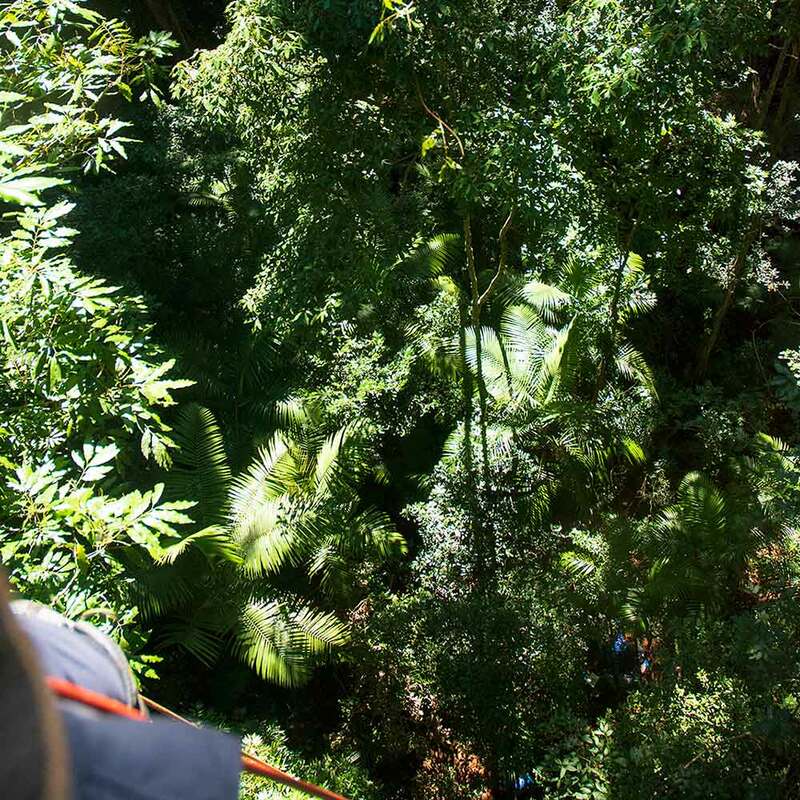 Scroll back to the top of the page to see the photos from within the canopy. the giants of the undergrowth build their burrows. They drag with them the forest carpet. I was rostered to spend some one-on-one time with Dala in the final BioBlitz morning, but my ascent up Mook Mook changed plans. I did manage about 30 minutes walking in and around her canopy perimeter on the forest floor. More careful walking and stepping. Touching. Seeing. Reading. It felt intimate. I was alone with the tree. I felt like I spent a few precious moments in silent conversation with her. I could still see the host tree inside the strangler vines. The wines and roots seemed to disappear down into the underworld and up into an open void. While conversing with Dala I spotted fellow artist Jono Bateman quietly working in the tree’s visual diary. He doesn’t know I took this photo (yet!). 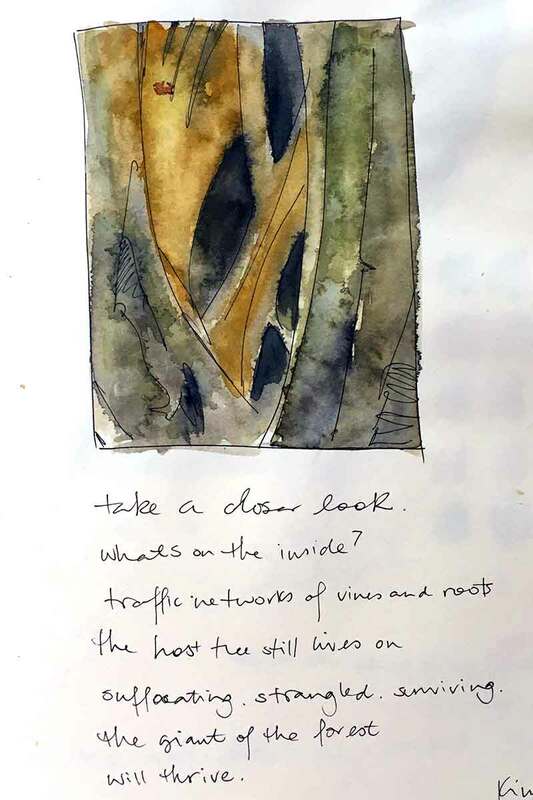 Below that are a few snapshots of my pages from Dala’s visual diary. Djuli Djuli was the tree I spent the most time with. 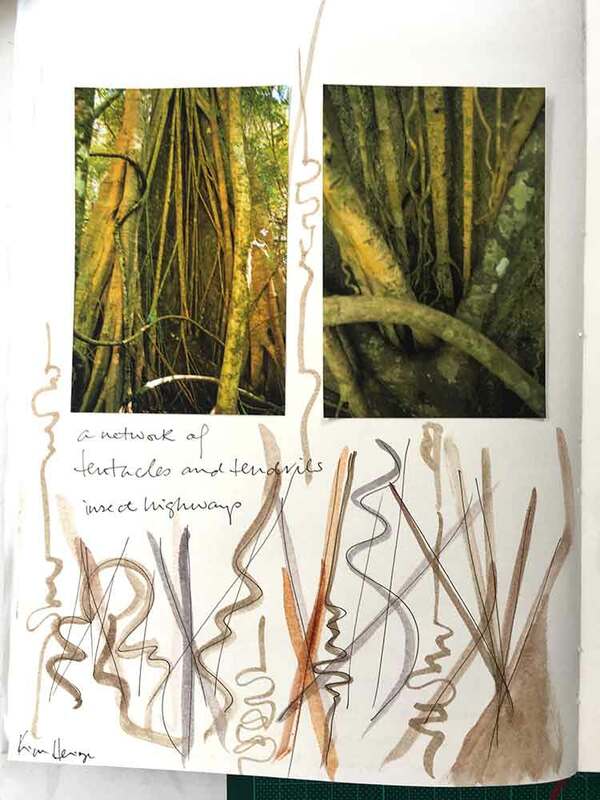 I spent several hours on the afternoon of Day 1 sitting at the canopy perimeter line, drawing in her visual diary. The aborists were taking scientists up the tree that afternoon, so, for safety reasons, I couldn’t enter under the canopy perimeter area. That was frustrating, but totally understandable; and it forced me to sit back and look and listen to her and her immediate surrounds. The experience reminded my of a poem I read while in high school, and one that I have never forgotten. 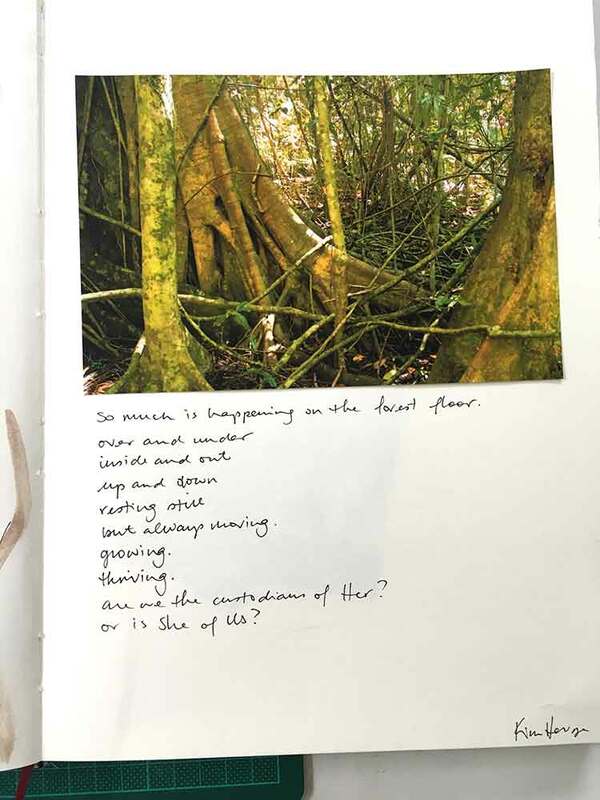 I thought it appropriate to share it on the first page of this tree’s visual diary. I am in awe of the resilience, tenacity and effortless struggle of nature. As humans we work hard to invent, understand, control, live, thrive, create and destroy … nature just does it, effortlessly. I think there is more happening up than down. Dancing to her own tidal flow. Kim Herringe – that’s me! If you’re reading this, then you probably know a bit about me already. If not, I am a printmaker, drawing on my natural environment for inspiration in my work. Click here if you would like to learn a bit more about me. Jason Murphy is a Dungidau man of Jinibara descent. Jason’s artwork utilises acrylic paintings, collage and drawings to critique social, political and cultural issues affecting Aboriginal people. It was an absolute pleasure to meet you Jason. I think you are heading for some very exciting and grand adventures! I can’t find a website for Jason, but as soon as I do I’ll add it here so you can check out his work! You can read a little about Jason here. 4 days was simply not enough time to do everything I wanted to do during this BioBlitz experience. I spoke with many people on the Survey Team, but not everyone. I would love to have spent more time with the scientists, talking about and understanding their fields of expertise, their professional passions. 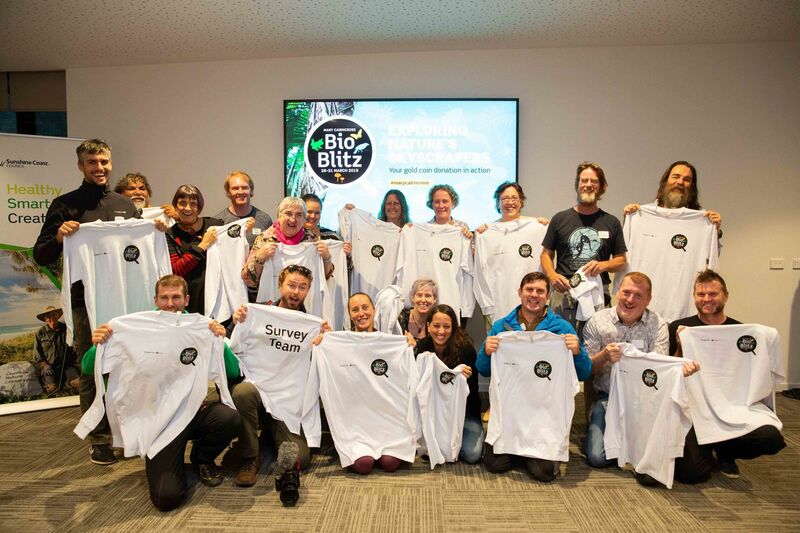 The photos below was taken at the Launch Event for the Mary Cairncross BioBlitz, and borrowed from the Sunshine Coast Council Facebook page. A project of this scale doesn’t ‘just happen’. 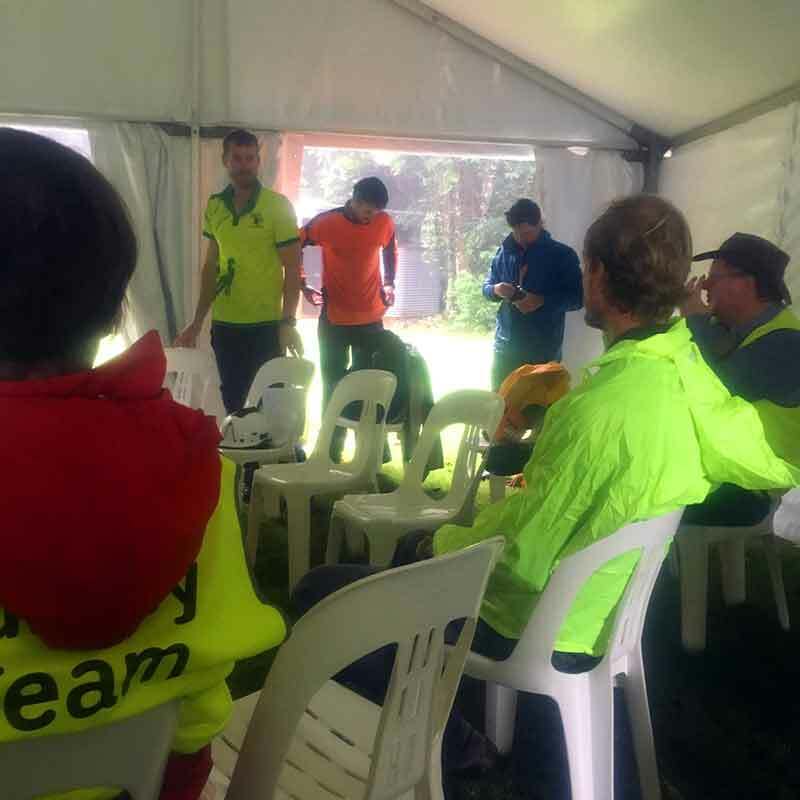 Adding to the Survey Team was a band of dedicated volunteers, planners and coordinators. In all there were over 60 people involved. 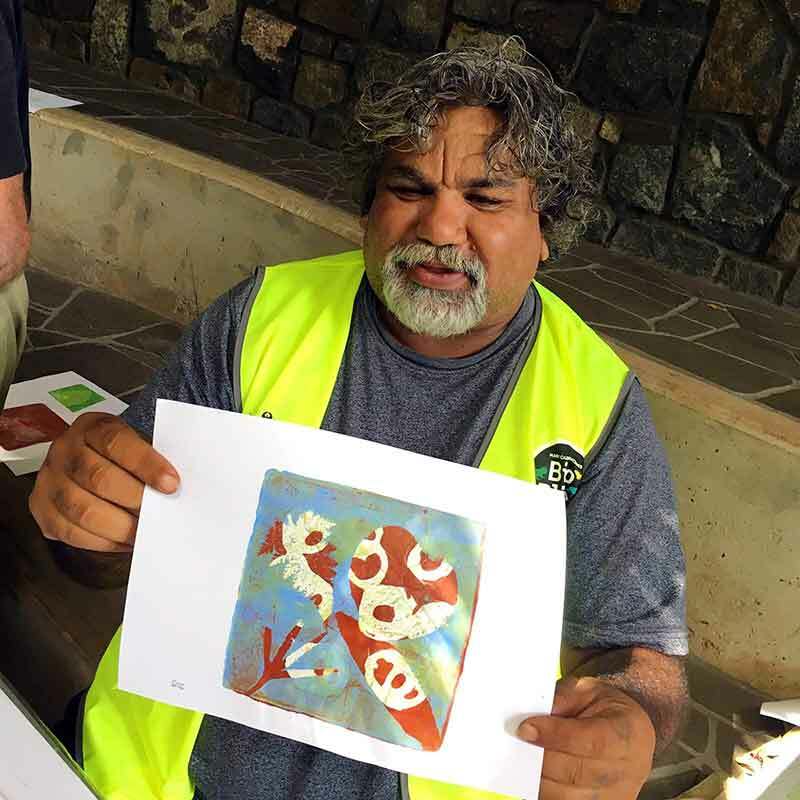 In addition to the scientists and artists were project partners: Entomological Society of Queensland, Evergreen Tree Care, Griffith University, Jinibara People Aboriginal Corporation, Maleny Printmakers, Oberonia Botanical Services, Queensland Mycological Society, Queensland Plant Pathology Herbarium, Queensland University of Technology, Seed Consulting Services, University of the Sunshine Coast, University of Tasmania and The Tree Projects. 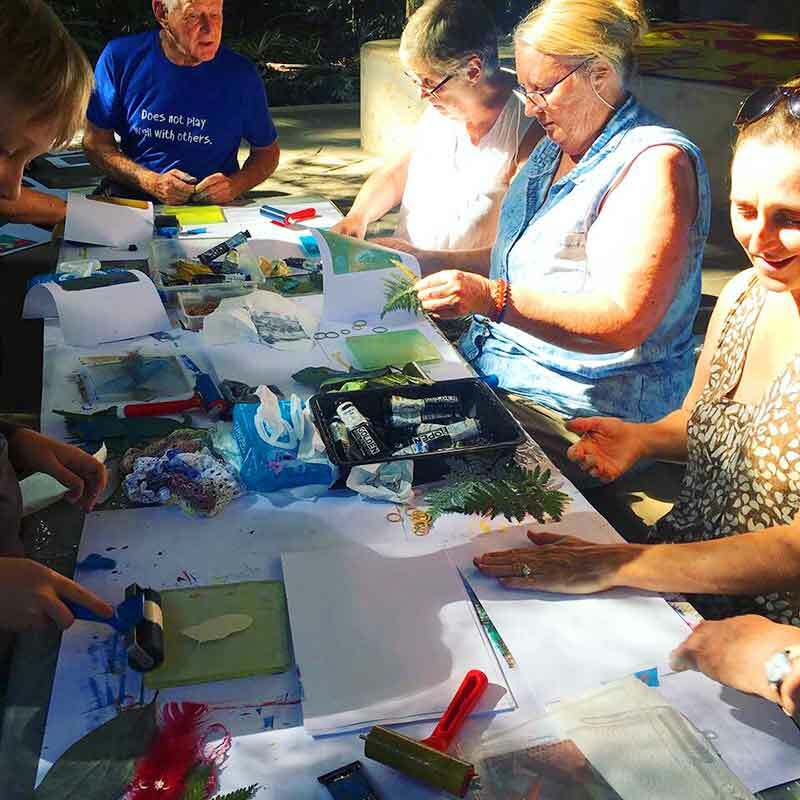 As part of the BioBlitz I ran two short Gelatin Plate Monoprinting workshops. 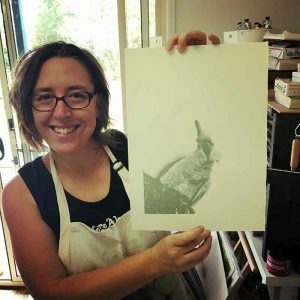 I did this with the help of Karen Shaw and Jillian Bergman from the Maleny Printmakers. It was great fun, and great to see young and old getting involved. 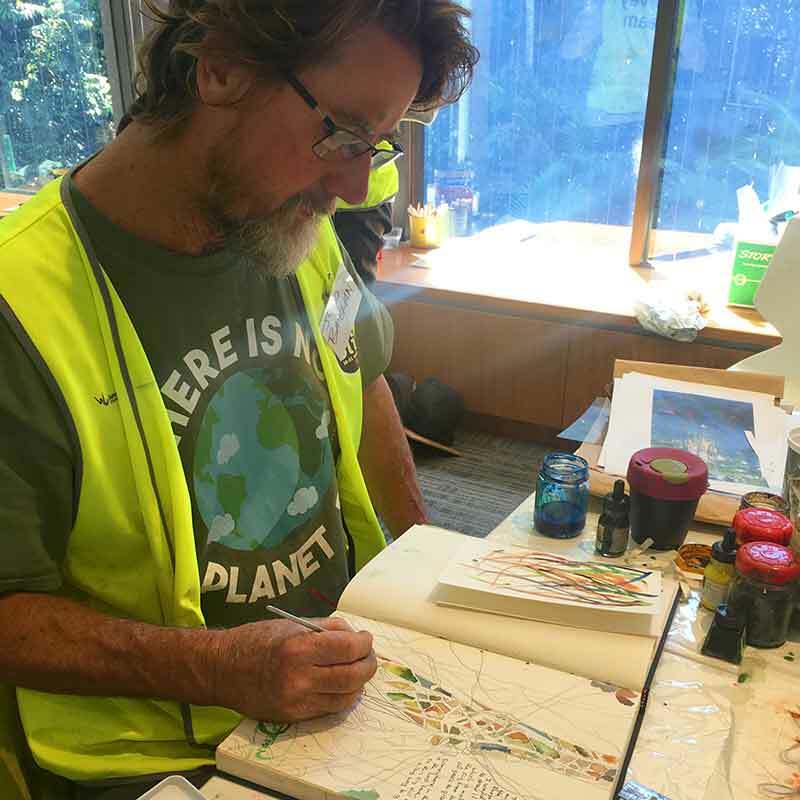 We were given special permission to use select leaves from the Reserve to create our monoprints, and all students made they own personal momentos of the Mary Cairncross Scenic Reserve to take home. If you’re interested in learning this process, click here have a look at the full day workshop I run from my studio in North Maleny. My head and heart are popping and spinning and considering and resting with ideas from this unique and very special experience. It has been lovely to look through my photos and revisit the experience. It’s been a nice way to reflect back on the 4 days. 4 days that simply flew by! I have my first solo art exhibition coming up later this year at the Maroochydore Library Artspace. Moments from this experience will help inform what is created for part of that exhibition. In addition, the Survey Team artists are talking about a group exhibition to celebrate the experience. What a show that would be! Watch this space for more information as events evolve. But right now, I’m off to create some inky fingers and get back to printing for the first time in my new studio!